Hello guys, we met again. 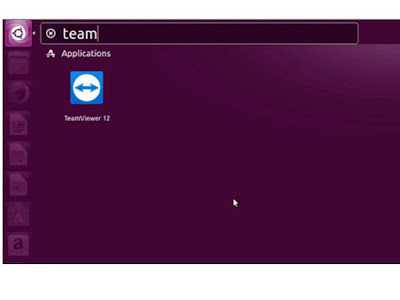 This time I will show you how to install team viewer on Ubuntu. Of course Operating system that we use is Linux. Team viewer is remote controlling software for computer client which use internet as network. Team viewer is very helpful to remote the other computer from far away. Usually if we want to use Team viewer is working smooth and fast, we must use internet which have good and fast connection. Team viewer almost install on windows. But several users is using it on Linux. The installation on ubuntu is different from windows. The First way Install Team Viewer, There are steps to install it on ubuntu. 3. And then choose type of Linux Operating System, there are three type linux that support. first:Ubuntu,Debian. 4. if your linux operating system using ubuntu then choose Ubuntu and So do I, I choosed Ubuntu because my computer using Linux Ubuntu. 8. Then to find team viewer software just search on Unity (Top Left menu button). The icon of it will appear. The Second way Install Team Viewer, so as the first. In this way we have several step to install it. 1. Open Terminal on menu bar, if the terminal don’t show on menu bar just search on Unity. That all guys the way to install TeamViewer, I hope it will now be ready for use and will be present in your menu. 18 Responses to "HOW TO INSTALL TEAM VIEWER ON UBUNTU"
Oh thank you for this!! It's a great learning post! Great post!! I will share this with my yonger brother, He was thinking to install team viewer on ubuntu. Interesting post about how to install this viewer. I'll keep it in mind. Such an interesting post. Now I know about team viewer on Linux os. Wow great post, I have a friend who use this will share it with her. Hm, if I ever need to do this at least I will now know how to. Thanks. Thank you for sharing this.Great post.I should apply this when in need. This is a super helpful tutorial! It helped me greatly to get this done! Ahh... I am very bad with Linux distros. But the instructions were pretty easy. I’ve learned that I can rely on your posts for timely, relevant, USEFUL information. Thank you. Great information. You always bring us up to date information, stated in easy to understand terms and It is not overwhelming. I appreciate that and I look forward to what is next. Great content, such a useful tutorial, I was actually thinking on how to do it better. This blog is on a right timing. I've never used Ubuntu OS but this is pretty helpful for those who does. Thanks for breaking this down into easy to follow steps. This is a very helpful resource! I love that you made this easy for us to follow. Thanks for sharing.